Special Skills: Skates along electric power lines; can zap unsuspecting people with lightning-like bolts of raw energy. 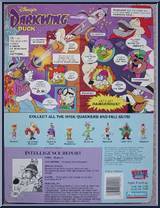 Quote: "You'll get a real charge out of this, Darkwing Duck!" Personality: A living, breathing battery, this shocking villain can transform ordinary household appliances into "electrifying" tools of destruction. 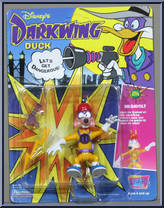 His bitter feud with Darkwing Duck has led him to target the secret agent as his number one object of devastating static. 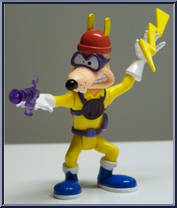 Fortunately for Darkwing, Megavolt's power trips fried his mind a long time ago. That explains his long conversations with light bulbs and toasters. Contribute pictures, update details or suggest corrections for Megavolt. Write a review about Megavolt.